The designer’s concept for the Alba range of lighting was inspired by her observations of the shapes of water drops. Each “diffuser droplet” is composed of mouth-blown, polished opaline glass that is oriented differently based upon its specific application as table, floor, suspension, or wall lighting. This beautifully formed organic shape contrasts markedly with the strong geometry of its rectilinear-profile satin brass supports. 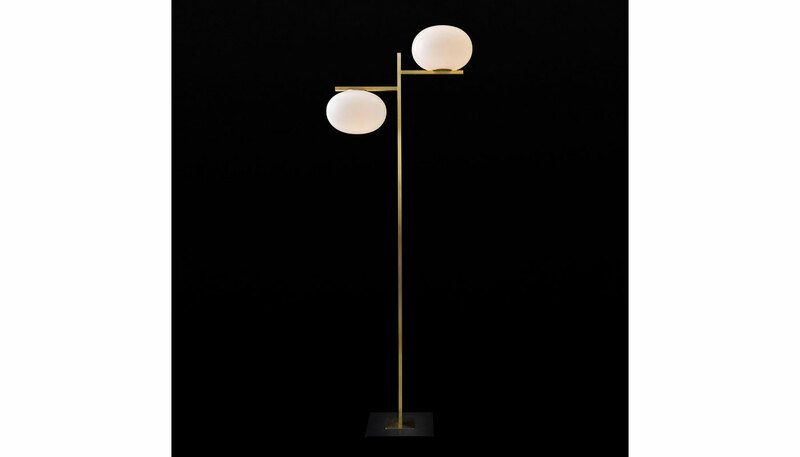 Noted here is the Alba floor lamp 383 that features two “diffuser droplets” – one oriented downward; the other upward. Square base in an anthracite finish. Manufactured by Oluce.